With Lionel Messi not in the Albiceleste's squad, a crowd of just 35,624 turned out at MetLife Stadium. 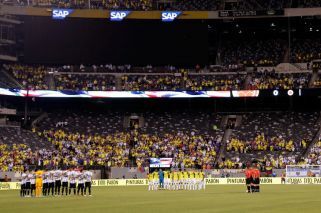 With Lionel Messi not in the Albiceleste's squad, a crowd of just 35,624 turned out at MetLife Stadium to watch a 0-0 draw between Argentina and Colombia on Tuesday night. Colombian, who have just lost their manager José Pékerman, were also missing star playmaker James Rodríguez. With Messi, Argentina drew three large crowds to MetLife: 78,936 for a friendly against the United States in 2011, 81,994 for an exhibition against Brazil the following year and 82,026 for the 2016 Copa América final against Chile. Just 32,469 attended Brazil's 2-0 exhibition win last week over the United States, down from 77,223 at a 2010 US-Brazil game there shortly after the venue opened. MetLife Stadium is a possible site of the 2026 World Cup final.